Treat your acne from the inside out. The most visible signs of acne are on your skin, and because of this many people take a topical approach to dealing with breakouts-there are probably more acne-fighting creams, pads, and lotions than a person could try in one lifetime! However, these types of products only address the external symptoms of acne, without addressing the underlying causes of the problem, and therefore they really cannot break the cycle of acne. Before a pimple even starts to form, most acneproblems begin as a hormonal imbalance in your bloodstream. When too much free androgen (the male hormones found in both men and women) circulates in your blood, they can affect many different organs. The skin is the largest organ in our body and sebaceous glands in the skin can be overstimulated by hormones and as a result, produce more skin oil (also known as sebum). The excess sebum binds dirt and dead skin cells and clogs your pores, creating a breeding ground for acne-causing bacteria. While topical products may help eliminate some of this excess sebum and even kill some bacteria, your complexion will continue to suffer until you start addressing the inner causes of acne. 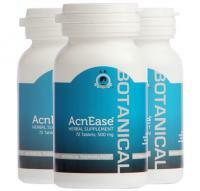 AcnEase® is a unique treatment designed around the principle of addressing BOTH causes and symptoms of acne. It is a safe, natural, and gentle way to help prevent your skin's response to excess hormones without actually affecting the hormone levels. It's the first step in creating the beautiful, healthy skin you're looking for! There is an old saying that you are what you eat...how true! The things you eat have a major impact on your health, and as a result also affect your skin. When you make smart dietary choices, you may find your skin and acne improves, but making the wrong ones can actually make it worse. The most important thing to remember when it comes to food and acne is to think about your sugar intake-both how much you're eating and what kinds. Refined, white sugar (found in everything from soda to bread) has a tendency to cause glycation and inflammation of the skin. These two processes interrupt the normal production of collagen and leave your skin looking dull and older than it actually is. Additionally, inflammation can exacerbate existing breakouts, prolong the healing time and mayeven transform some of your breakouts into full-fledge cysts. If you have a sweet tooth and can't part with sugar entirely, turn to fruit instead. While you still need to eat it in moderation, it has less of a negative effect on your skin. In fact, some fruits are full of antioxidants that can actually benefit you! The most well-known of these is vitamin C, which can be found in everything from oranges and grapefruit to peppers and kale. It's been shown to stimulate the production of collagen, combating the effects of glycation and inflammation. Another powerful antioxidant, vitamin E, has been shown to reduce the appearance of acne scars and can be found in fruits like apricots and papaya. Find a cleansing routine that works with your skin type. Unfortunately, there isn't one single skin cleansing routine that will work for everyone-it may take a little experimentation on your part to find products that give you a healthy complexion. People can be broken down into two basic categories-those whose skin is too oily and those whose skin is too dry. Which category you fall into will largely dictate how you should approach your cleansing regimen. If you're an oily skin person, you'll want to avoid products that will excessively moisturize your face. At best, this is unnecessary, but at worst, this will actually clog your pores more and increase your breakouts. If possible, choose a cleanser labeled as noncomedogenic-this means it has been designed to prevent such clogging. For people with dry skin, it's best to do the opposite-choose a cleanser with a built-in moisturizer to give your face the hydration it needs. Regardless of your skin type, you'll want to avoid harsh products that contain chemicals such as salicylic acid, benzoyl peroxide and alcohol. These can irritate and sensitize your skin. In addition to aging your skin, they may actually make your acne problems worse-especially if you have an allergic reaction to them.